Husband: "You need to write that novel and buy me new stuff that I don't have to fix." Wife: "Is the freebie wearing you down?" Husband: "Hey, I paid for that." Wife: "Oh, it looked like it should have been free." "God takes care of stupid people." We used to describe other people this way, when it looked like someone that made an awful decision didn't face any consequences. It was a running joke because we tend to think most people make terrible decisions. Yeah, we're judging you. But this week, I'm hoping that's true for me, as I am living the Mommy/Writer/Farm wife life, and it's demanding and exhausting. My husband: "You need to get a job." This is after one week of being a stay-at-home mommy and farm wife. I got up early to write. When I took a break, I told him my next blog was about his hoarding obsession, and I guess he didn't think it was as funny as I did. I think he was hoping I'd have more time to help him out and less time to think of things to write about. He doesn't realize that one feeds off the other. Since my regulars have only said things lately that are inappropriate or offensive, I was forced to go back to an old one. At least it reminds us of warm weather, when we enjoyed completing projects outside. Jessica via text: "Is that you that just drove by? You should come by and check out our redneck cable!" Vocab lesson for the day: Redneck cable (noun) - the regular free channels you get in the country when you buy a ginormous antennae. Me: Don't mess with that poop! With cow poop, sheep poop, dog poop, and his own poop, it's a never ending job keeping a two-year-old out of poop on a farm. John: Do you think Jessica would give me free vet services for Christmas? John: Those crazy cows just need some lovin' to settle them down. Me: So are you going to buy a bunch of crazy cows to show everyone that you can tame them? John: It worked with you didn't it. 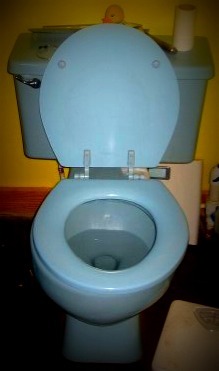 Quote of the week: "Found a blue toilet seat that perfectly matches my blue toilet! Now I call that a successful day of shopping." Another gem from my sister-in-law, who's had all kinds of toilet problems, but being blue isn't one of them. It's always big trouble when my husband comes home saying, "I've got a plan." 1.) Farm animals in my yard. 2.) Farm animals in my house. 3.) Farm animals in my car. 4.) Farm animals crossing the highway. 5.) Something being broken in the process of this plan like farm machinery, waterpipes, woodstoves, electricity - basically the essentials. Me: I need to remember that God takes care of stupid people. John: And if he doesn't, I will. My husband is sometimes a turd, but he really knows when to pull out the big guns. Witty and sweet! Wife: Trying to build a fire. It would be handy if I had matches. Husband: Oh, you don't need matches. Just turn on a burner on the stove and hold a piece of paper up to it once it gets hot. Wife: Seriously?! I feel like I'm camping everyday here.